Escobedo (b. 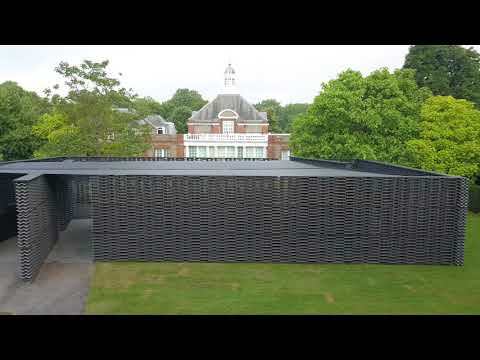 1979, Mexico City) was the 18th and youngest architect yet to accept the invitation to design a temporary Pavilion on the Serpentine Gallery lawn in Kensington Gardens. This pioneering commission, which began in 2000 with Zaha Hadid, has presented the first UK buildings of some of the biggest names in international architecture. In recent years, it has grown into a hotly anticipated showcase for emerging talent, from Sou Fujimoto of Japan to selgascano of Spain and Bjarke Ingels of Denmark. Serpentine Galleries Artistic Director Hans Ulrich Obrist and CEO Yana Peel selected the 2018 architect, with advisors David Adjaye and Richard Rogers. Escobedo’s Pavilion took the form of an enclosed courtyard, comprised of two rectangular volumes positioned at an angle. While the outer walls were aligned with the Serpentine Gallery’s eastern façade, the axis of the internal courtyard aligned directly to the north. Internal courtyards are a common feature of Mexican domestic architecture, while the Pavilion’s pivoted axis referred to the Prime Meridian, which was established in 1851 at Greenwich and became the global standard marker of time and geographical distance. British-made materials were used in the Pavilion’s construction, chosen for their dark colours and textured surfaces. A celosia – a traditional breeze wall also common to Mexican architecture – was here composed of a lattice of cement roof tiles that diffused the view out into the park, transforming it into a vibrant blur of greens and blues from within. Two reflecting elements emphasised the movement of light and shadow inside the Pavilion over the course of the day. The curved underside of the canopy was clad with mirrored panels, and a triangular pool cast into the Pavilion floor traced its boundary directly beneath the edge of the roof, along the north axis of the Meridian. As the sun moved across the sky, reflected and refracted by these features, visitors may have felt a heightened awareness of time spent in play, improvisation and contemplation over the summer months. The Serpentine Pavilion 2018 was once again a platform for Park Nights, the Serpentine’s annual programme of experimental and interdisciplinary evenings on selected Fridays. Practitioners in the fields of art, architecture, music, film, theory and dance were commissioned to create new, site-specific works in response to Escobedo’s design, offering unique ways of experiencing architecture and performance, sponsored by COS. Building on its 2017 success, Radical Kitchen also returned to the Pavilion on selected Thursday lunchtimes, inviting community groups, artists, activists, writers and architects to form connections through food. This programme of workshops, performances and talks addressed geological time, empire and movements, inspired by the ideas behind Escobedo’s Pavilion design. The Architecture Family Pack and Programme, sponsored by COS, gave children and their families the chance to explore the Serpentine Pavilion from playful and original perspectives. "I think one needs to plan for change. Make everything more flexible in every way, so that the building becomes more like a palm tree and less like a completely rigid structure, because that’s the one that will fall down. Rigid things collapse. The rest can move, yes, it transforms, it may lose sections, but its spirit will remain." Frida Escobedo in an interview with The Fabulist. On the occasion of the 2018 Serpentine Pavilion, the Serpentine partnered with Aesop to co-present a special issue of The Fabulist that explored the themes of the Serpentine’s summer season and celebrated Aesop’s support of Live Programmes at the Serpentine. The design for the Serpentine Pavilion 2018 is a meeting of material and historical inspirations inseparable from the city of London itself and an idea which has been central to our practice from the beginning: the expression of time in architecture through inventive use of everyday materials and simple forms. For the Serpentine Pavilion, we have added the materials of light and shadow, reflection and refraction, turning the building into a timepiece that charts the passage of the day. Frida Escobedo (b. 1979, Mexico City) founded her practice in 2006. Escobedo's award-winning work has focused mainly on reactivating urban spaces that are considered to be residual or forgotten. She was co-director of the architectural firm Perro Rojo for four years. In 2004 she was awarded the Scholarship for Young Creators by the National Fund for Arts and Culture (FONCA) and in 2008 she was selected by Herzog & de Meuron as one of the architectural studios to participate in the Ordos 100 Project in Inner Mongolia, China. In 2009, she was a winner of the Young Architects Forum, organised by the Architectural League of New York. In 2013, she was selected as one of the three finalists for the Architecture programme at the Rolex Mentor and Protégé Arts Initiative and was nominated for the Arc Vision Prize for Women and the Iakov Chernikhov Prize. In 2014, she was selected as a finalist for the Designs of the Year at the Design Museum in London and was nominated for the Mies Crown Hall Americas Prize of the Illinois Institute of Technology. In 2014, she won the Ibero-American Biennale of Architecture and Urbanism Prize (IX BIAU) in Rosario, Argentina. In 2017, she received the Emerging Voices Award by the Architectural League of New York. 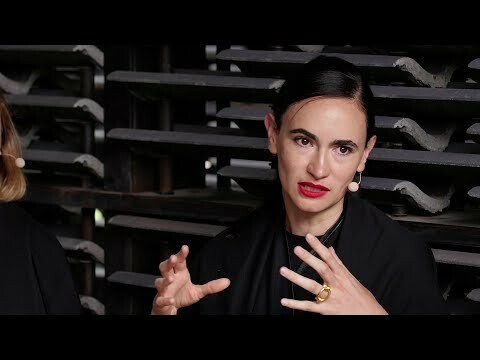 Architect Frida Escobedo, celebrated for dynamic projects that reactivate urban space, was in conversation with architect and educator Mohsen Mostafavi, architect and researcher Marina Otero Verzier and Hans Ulrich Obrist, Artistic Director, Serpentine Galleries, discussing the material and historical inspirations behind this year's Serpentine Pavilion and the expression of time in architecture.